Stilettos are used to force the weave of the fabric open to make an eyelet hole or to insert the shank of a metal button to allow the button to sit flush to the fabric. Because the fabric is not cut, the eyelet is stronger and resists ripping. 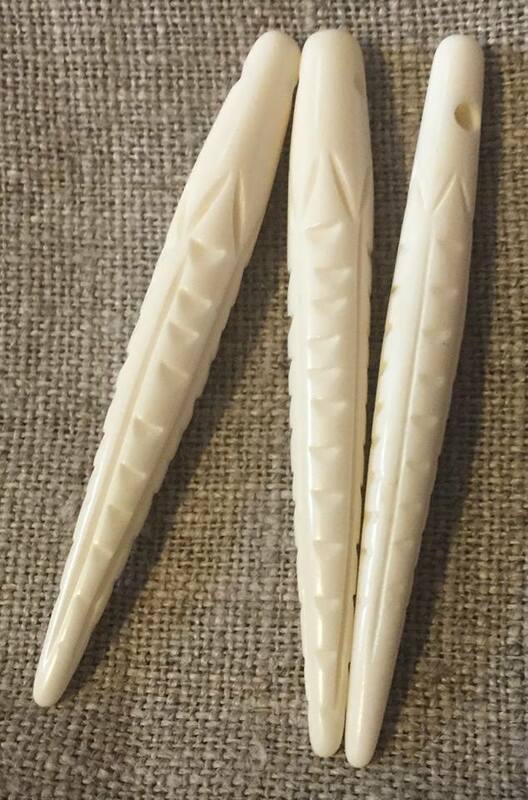 These bone stilettos are about 2 1/2" (6.3 cm) long. Thread buttons can also be made with these. Directions for making eyelets and thread buttons are included in The Lady's Guide to Plain Sewing Book I with an eyelet variation in Book II. Directions for attaching shanked buttons using a stiletto may be found in The Workman's Guide to Tailoring Stitches and Techniques. A fancy carved ivory stiletto is on page 80 of Taunton, Nerylla, 1997, Antique Needlework Tools and Embroideries; Antique Collectors' Club Ltd.